The West Mancos Trailhead is located adjacent to the Big Al Trail in the Transfer Recreation Area. The first 1/3 of a mile is shared with the Transfer Trail. The combined trails drop immediately into the West Mancos Canyon via several switchbacks. After approximately 1/3 of a mile, the trail splits, with the West Mancos Trail continuing upstream, and the Transfer Trail heading downstream. Due to the steep nature of the upper portion of this trail, it can be very tricky and even more so in wet conditions. If using this trail in early spring, be aware of the potential for downed trees and the trail sloughing off in places. 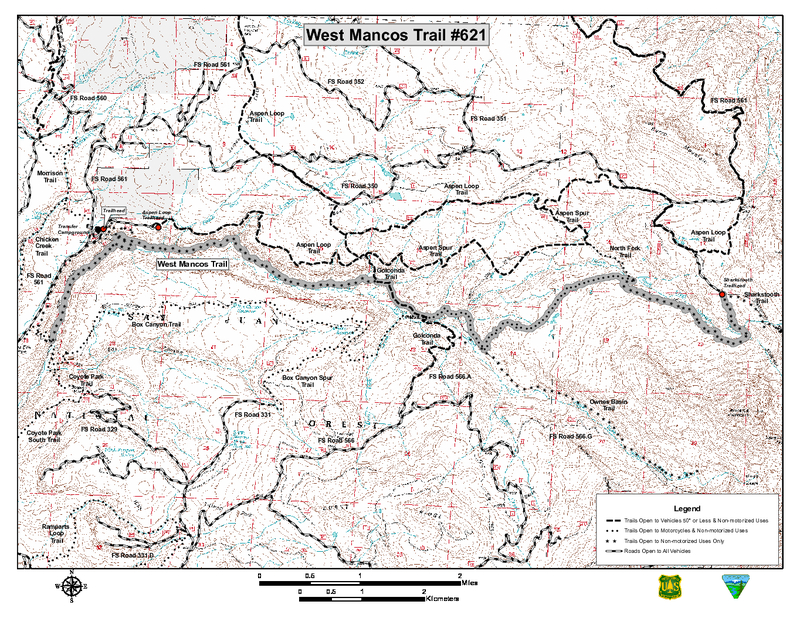 Be especially careful if you are on horseback.The West Mancos trail continues upstream on the west side of the canyon before dropping down to the West Mancos River level. The trail passes the junction with Owens Basin Trail, and then climbs steeply to Horsefly Flat, an open grassy area. The trail ends at the Sharkstooth Trailhead, which is located near the base of Hesperus and Sharkstooth Peaks. Next to the Big Al Trailhead is the West Mancos and Transfer Trailhead. These trails share one trail for the first ½ mile. The trail immediately drops down into the West Mancos River Canyon via several switchbacks. After about ½ mile the trail splits, with the West Mancos continuing up river, and the Transfer trail heading down river. Due to the steep nature of the upper portion of this trail, it can be very tricky in wet conditions and, if using this trail in early spring, be aware of downed trees and the trail sloughing off in places. Be especially careful if you are on horseback. The West Mancos Trail continues upstream on the west side of the canyon before dropping to the West Mancos River level, then climbs steeply to Horsefly Flat, an open, grassy area. The trail ends at the Sharkstooth Trailhead, at the base of Hesperus Peak. From the town of Mancos, turn north on Highway 184, turn right after .3 miles on West Mancos Road, also known as CR 42. Travel 10 miles and turn into the Transfer Recreation Area. Parking is available in the parking area adjacent to the campground.